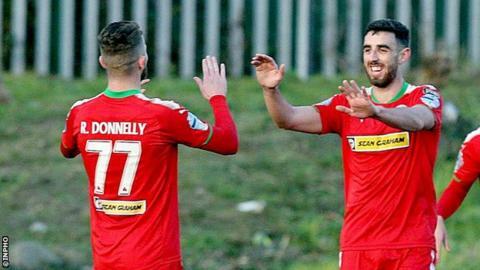 Cliftonville's Rory Donnelly and Joe Gormley have combined to score 16 goals in the the club's last ten matches. Glenavon manager Gary Hamilton says Cliftonville have started to "click" since manager Barry Gray's tactical switch to a two-man attack. Cliftonville have won their last six league games to move up to fourth place and within two points of Glenavon. Ahead of his side's visit to Solitude on Saturday, Hamilton says Gray's tactical move has revitalised the Reds. "We all knew whenever Rory and Joe's partnership clicked that they would be a match for any team," says Hamilton. "At the start of the season, Barry was maybe trying to accommodate too many of the front men in the one line-up and he's changed that and he's gone with the two [up front]. "He's playing Jay [Donnelly] out wide at the minute so he's got a settled team and they've got results since that happened." Glenavon are level on points with second-placed Crusaders ahead of Saturday's round of games, with both clubs trailing leaders Coleraine by six points. Coleraine will be hoping to maintain their advantage at the top of the table when they host a Dungannon Swifts side that has lost on three of their last four outings, although they were narrowly beaten by Linfield last time out. Crusaders' pursuit of the league leaders will take them to Milltown where they will hope to take all three points against Warrenpoint Town. It's the beginning of a crucial period of games for Crues, who are unbeaten in their last 11 matches. "We have Warrenpoint on Saturday and Dungannon in the semi-final of the League Cup on Tuesday and then Glenavon away," said Crusaders manager Stephen Baxter. "We have three away fixtures and those will test us. Our away form has been brilliant this year so we have to be confident in what we do." Carrick have suffered eight defeats in their last eight matches across all competitions, which leaves them in the relegation zone, but Linfield could regain a place in the top four if they can secure their fourth consecutive victory. The defending champions beat Carrick earlier this season when Niall Quinn and Kirk Millar got the goals in a 2-0 victory at Windsor Park in August. Bottom of the table Ballinamallard United will visit the Oval on Saturday, hoping to take advantage of Glentoran's recent poor form, which has seen them win just once in their last five outings. Ards and Ballymena United will meet for the third time this season with David Jeffrey's side hoping to break into the top six if results elsewhere go their way.